Is It Pressure or Is It Gauze That Stops Bleeding? Can you stop arterial bleeding with just your hands and no gauze or cloth? It's both pressure and gauze. You can stop bleeding with just your hands, but it's significantly easier and better for the patient if you have gauze, too. Getting blood to stop flowing out of a leak in the system is important for the body to respond to injuries and avoid shock. We get small irritations and minor leaks all the time, and the body has to stop that leak to allow time for the injury to heal. Bleeding stops when the blood coming out of the wound clots (coagulates). Clotting happens as platelets, tiny particles in the bloodstream, interact with proteins. The proteins trigger the platelets to become fibrous and sticky – think spiderweb. Platelets stick together across an opening in the blood vessel (the wound) and plug the hole. The clot also provides a foundation for new tissue to grow. It's kind of like a microscopic scaffolding. Indeed, the whole process is similar to a construction project meeting a river. Pardon me while I mix metaphors to try to explain how this all works. If you've ever walked along a stream or a canal, you may have noticed that debris and algae tend to collect in places where the water doesn't flow very fast. In places where the river or stream runs quickly, nothing gathers. Bleeding is similar. In a wound from which blood is flowing freely, clots are unlikely to form. The rush of blood out of the hole doesn't allow the platelets any time to stick together. To help a clot form and bleeding to stop, we have to slow the flow down. We do this in four ways: pressure on the wound, elevation, pressure points and tourniquets. Direct pressure slows blood flow at the site of the injury and might even stop it completely. If so, you have a perfect situation for clotting to start. Elevation (raising the wound above the heart) slows blood flow simply because it's harder to flow uphill than downhill. Pressure points don't have a lot of evidence in research to support using them. The idea is to further slow blood flow downstream by stepping on the hose upstream (metaphor number two, but I'm not done). Tourniquets slow everything to a trickle downstream. The problem with tourniquets is that they cut off blood flow to everything downstream of the tourniquet and that can cause problems later if you don't get the tourniquet off in time. Oh, but I have another metaphor so we aren't done learning. You may be looking at how I started this answer and thinking, "Why gauze?" As I've pointed out, the trick to clotting is slowing the flow. Platelets come from the bloodstream. They're in the blood we're losing as we bleed. In order for platelets to stick together and start clotting, they need to stay put. That's where gauze comes in. 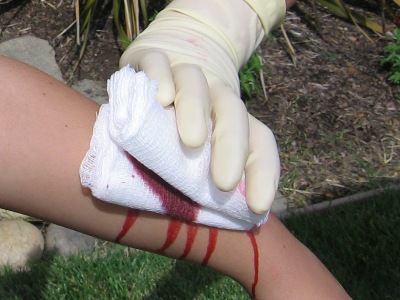 Gauze traps blood at the site of the injury. It provides a scaffolding for the scaffolding, so to speak. If you've ever seen a plasterer fill a hole in a wall, you'll get what I mean (metaphor number three). To fill a hole in a wall with plaster, you have to put something across it for the plaster to stick to. If not, the plaster will just fall in the hole. The bigger the hole, the more important it is to put something over it. Gauze works like the mesh you put across the hole to hold the plaster in place while it dries. Gauze holds the platelets in place so they can stick together and create a clot. It's important to hold the gauze in place after blood sticks to it. If you remove the gauze, you remove the clot and the whole process has to start over. This is a big problem with bloody noses. You want to encourage clotting by keeping the blood on the hole. If a piece of gauze gets soaked with blood, layer another piece of gauze on top of it. Keep doing that as you continue to hold pressure, elevate and use pressure points. If you can't do all that because you only have two hands and you still have to carry the wounded patient to safety, you can use a tourniquet. You still want to dress the wound with gauze if you have it so any blood that oozes out will be trapped at the wound to encourage clotting.